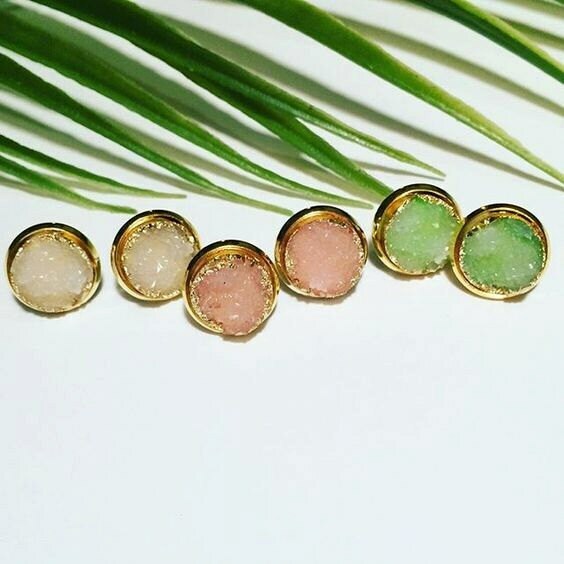 These Druzy studs are unique and gorgeous! 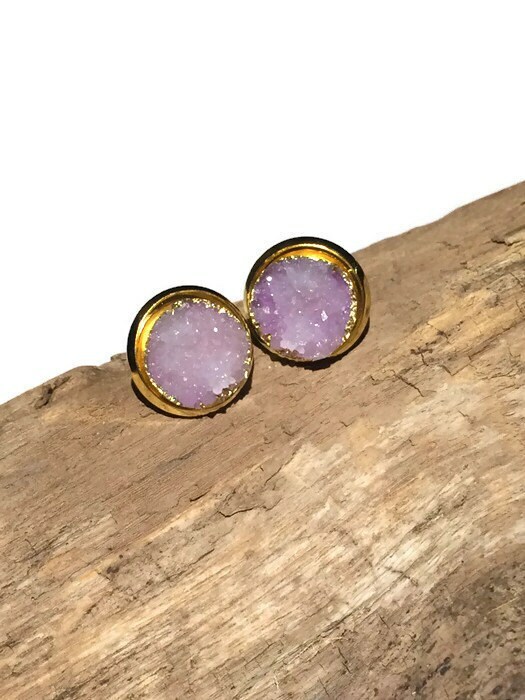 Small and dainty, easy to wear, these studs are handcrafted with care. Wearable day or night, adding sparkle to any outfit. 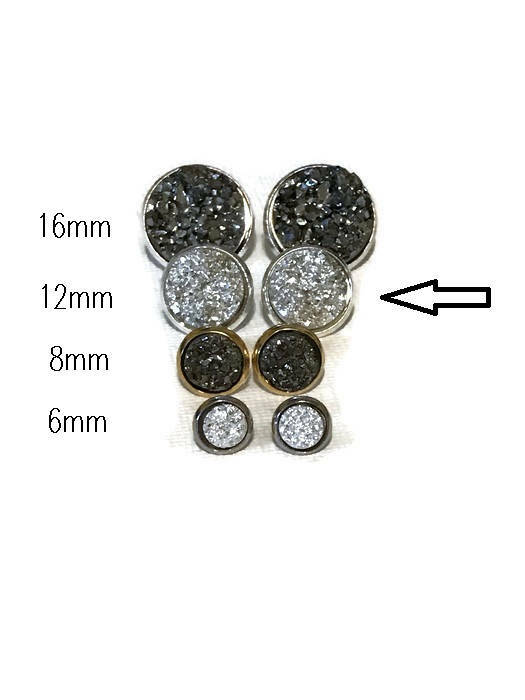 -*-Measuring 12 mm in diameter, approx.. ½ inch. -*- Nickel and lead free! 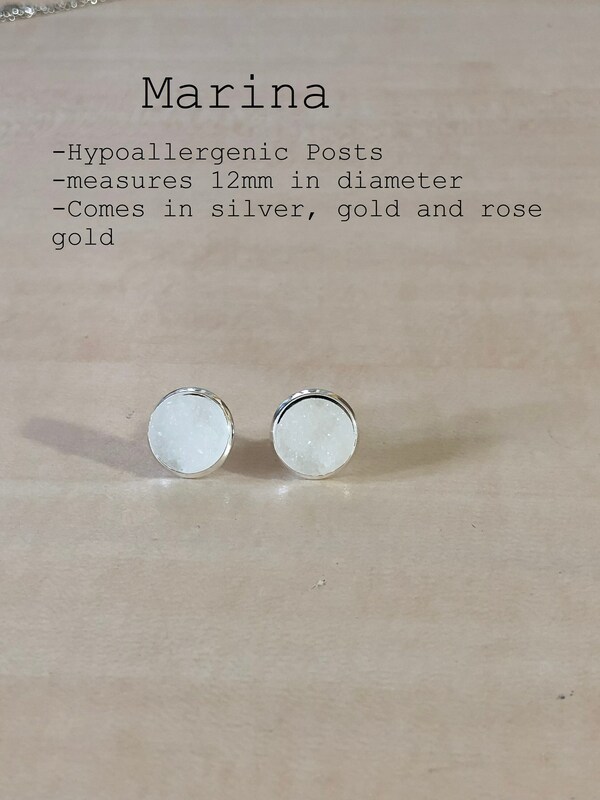 Completely hypoallergenic! -*- Each pair arrives in a small white gift box, wrapped in organic twine. Shipped in a bubble lined bag, your pieces are guaranteed to get to you safe and sound, without blemish or damage. -*-Are these for bridesmaids? Let me know! There is a discount available for purchasing FOUR or more pairs! CARE INSTRUCTIONS: The Designs by Katie Leigh Collection does know how to swim! Avoid salt water, chlorine, and polish with a silver polishing cloth. 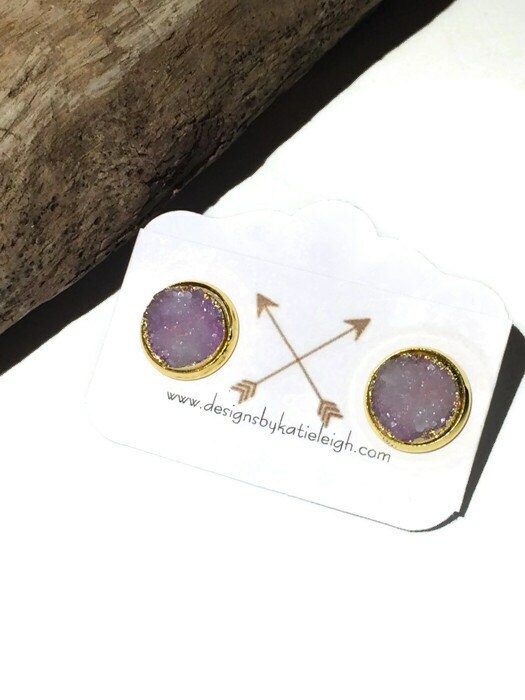 The pieces in the Designs by Katie Leigh Collection are bohemian, trendy, and feminine! Each piece is easy to care for, effortless to incorporate into your personal collection, and created by hand! Customization is available on request: Let us work with you! No Request is too big or too small! ||| Need gift wrap/gift note? ||| Let us know! We want our items to be personal and memorable for you, and the person you are giving them to! For your convenience we accept both PayPal and Etsy Gift Cards, as well as all major credit cards. Orders will not be shipped until payment is received, which can take up to three business days. All orders may be shipped within three business days of payment being received. Additional days may be required if orders are placed on holidays. Shipping will occur within three business days of receiving payment unless otherwise specified. Designs by Katie Leigh uses USPS, and due to post office hours, nothing will be able to be shipped on national holidays or Sundays. A message will be automatically sent to your e-mail when the order ships, which will include a delivery date and a tracking number. Shipping Insurance is available at checkout. Every order is packed carefully to withstand most shipping abuse. All products are packed in a strong envelope lined with bubble wrap to ensure the items will arrive safely. In addition each item is placed in its own gift box with our signature stamp. International orders are sent first class. international orders are shipped with no tracking number to most countries per USPS regulations. For international first class orders, tracking is available to the following countries: Canada, Australia, Belgium, Brazil, Croatia, Denmark, France, Germany, Great Britain and Northern Ireland, Israel, Netherlands, New Zealand, Spain and Switzerland. International Shipping may take (rarely) up to 6 weeks, depending on the countries customs policies the order is being shipped to. IMPORTANT NOTE: International buyers are responsible for any and all Customs Charges, Taxes & Additional Postage and Handling Fees that may be required. Please check your country's Customs rules and regulations before ordering. Earrings, Bezel links and all charms. We are confident in the steadfast quality of our products and the elements that we use. All materials are tested, tried and true, and have even past the toddler test! For wholesale, replacement and consignment questions, please email me directly at katiebugg106@yahoo.com, or send me a private message. Our business hours are Monday through Friday, 9 am-5pm EST. However, questions sent to our inbox are answered within a few hours! Do you do wholesale/ large orders? We do Gift wrapping on request, and we would also be happy to include a hand written note! Let us know in the notes to seller! All of our pieces are handmade, and require a kind hand. Most of our pieces are water resistant, but not water proof. Do not wear while swimming, in the shower, etc. Clean each piece with a polishing cloth and silver cleaner. We ship monday-friday at 10am to ensure that we get your package in the first shipment of the day. You can expect your package to ship 1-3 business days after your order is placed! I really liked these but only got to wear them once before they broke.